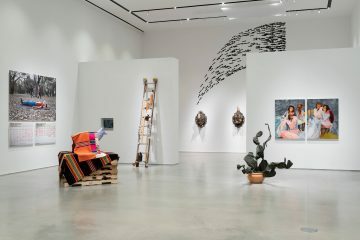 Curator Danielle O’Steen takes the notions you might have of an outdoor sculpture biennial and injects a heavy dose of the contemporaneous. Instead of a tired exercise in finding nice places to put weatherproof art, O’Steen found artists who were up for the challenge of bringing context to the forefront of the equation. Instead of playing the usual role of a curator, finding space and a theme for work, O’Steen has assembled a team of accomplished and experimental artists. She then armed them with the history and baggage of a historic neighborhood and asked them to react accordingly. As a result, it’s an exciting show and the neighborhood is fortunate to have an innovative curator bring life to location. As I walked through this year’s sculptural offerings, O’Steen was kind enough to walk with me and explain each project and answer my questions. More so than the others in the show, Winkler’s work starts by referencing the ubiquitous notion of outdoor sculpture; it’s big and metal and treats the space as a pedestal. However there’s also a kinetic tension to the piece. The half of the wheel that appears above ground references the detritus of formally working machinery. 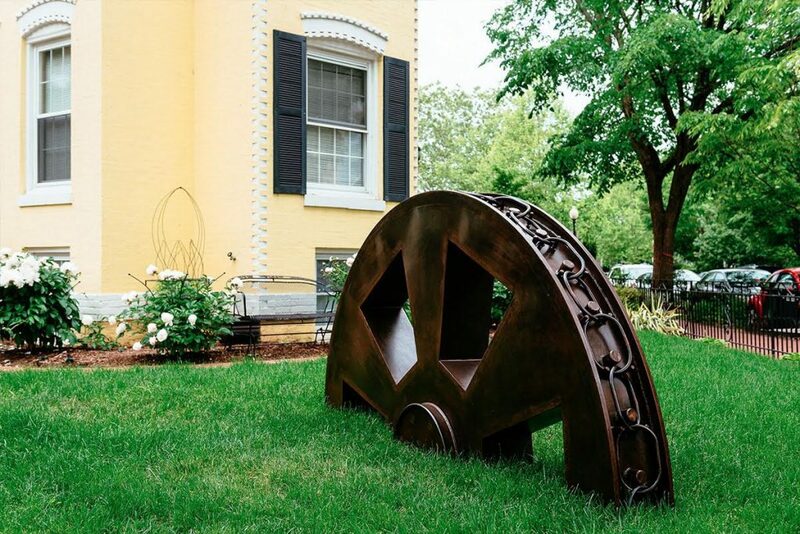 This piece reminds me of old wagon wheels that people use as lawn ornaments referencing Manifest Destiny and history of western expansion. Can you explain how this ties to the history of Foggy Bottom? Dane was very interested in the industrial history of Foggy Bottom, which is the foundation of the neighborhood. This legacy is still present in the late 19th – and early 20th -century homes originally built for factory workers that make up the area today. Dane’s work calls to mind a piece of defunct machinery that might have been left behind. The massive gear, while frozen in place, also seems to be capable of spinning, thereby dredging up other pieces of Foggy Bottom’s industrial past. Jonathan Monaghan has been churning out provocative digital work for years now, pushing connections between history and fantastical realities. However Monaghan’s work is usually very slick and digital, but this piece physically sits in real space. Can you talk about the material and the subject matter? 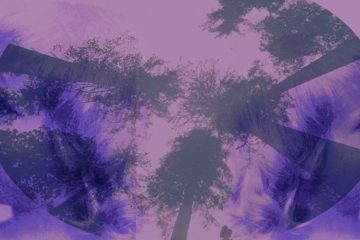 This piece is a nice companion to Jonathan’s digital work, as it engages technology in new and interesting ways, which is at the heart of his practice. In the sculpture, Jonathan pays homage to the 17th century painting Agnus Dei (The Lamb of God) by Francisco de Zurbaran, of a bound lamb. He modeled the sculpture digitally and then sent instructions to a workshop in Italy, which carved it with robotic arms in Carrara marble. The resulting work showing the lamb’s shape swathed in what appears to be a tufted, ornamented couch, enhanced with golden buttons in 3D printed steel. The very making of the work comments on our reliance on technology, but then the work is all about materialism, with the decorative details and sumptuous marble. I loved the idea of bringing all of these ideas outside in public space and introducing this animal-like creature into a natural environment, as if something so contemporary and so unnatural has found its habitat. 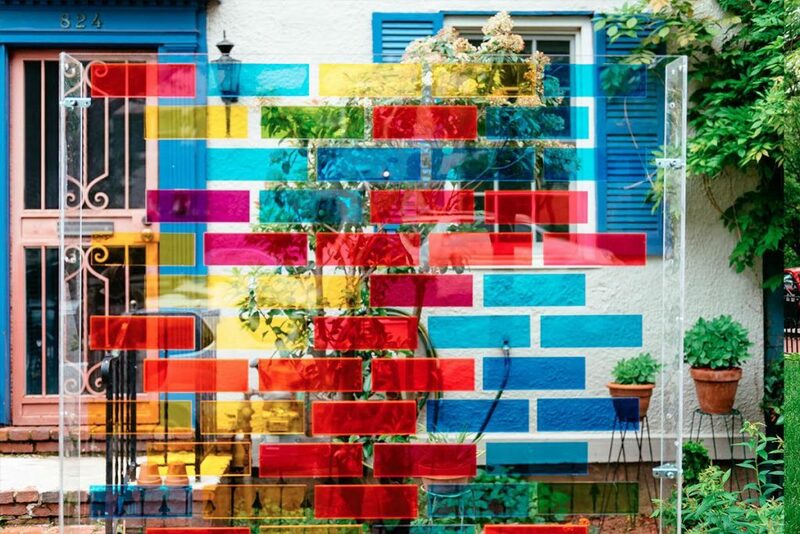 This piece references the historic building material of Foggy Bottom, and yet the material they’re made of is without the rigid function and references a future where houses are no longer made of bricks. How do those notions reconcile each other? I love the way you frame Becky’s work, as if it’s speaking to some strange, plastics-laden future. Becky was definitely interested in calling our attention to the brickwork that is so prevalent in this neighborhood without obscuring it. So the transparency, lightness, and color of the sculpture—all really possible because it’s plastic—was necessary to allow for new perspective of the buildings behind. I also think this big plastic wall is unexpected in a really interested way, it’s not what people expect to see in an outdoor sculpture exhibit where works are often more solid, heavy. This is a very different type of monument, but a monument still to the history of brickwork in Foggy Bottom. 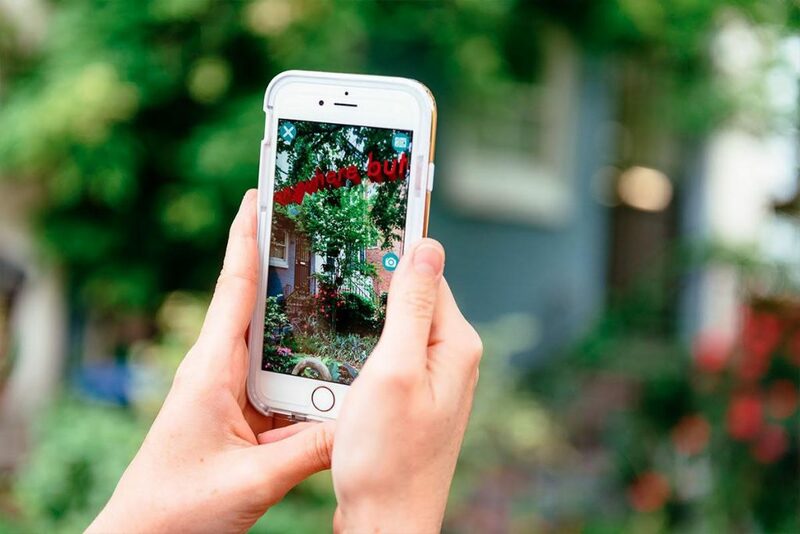 Davis places a looping sculpture with instructions to view in Augmented Reality. For this piece the viewer needs to actually download a program to their phone to see the virtual component of it, which is the real payoff for the viewer. Did you consider that might leave some viewers out? The digital, interactive element provides a companion to the physical sculpture, and challenges the idea of where we think the artwork lives. While the inscription on the sculpture—“Here”—is seemingly inscribed in stone (actually, concrete), the “Anywhere but” accessible through AR is ethereal and only loosely tied to a specific place. So viewers who find that second element are rewarded for spending more time with the artwork, but those who don’t see it have a very different, equally important engagement with the sculpture. These stairs toe the line between function and functionless. 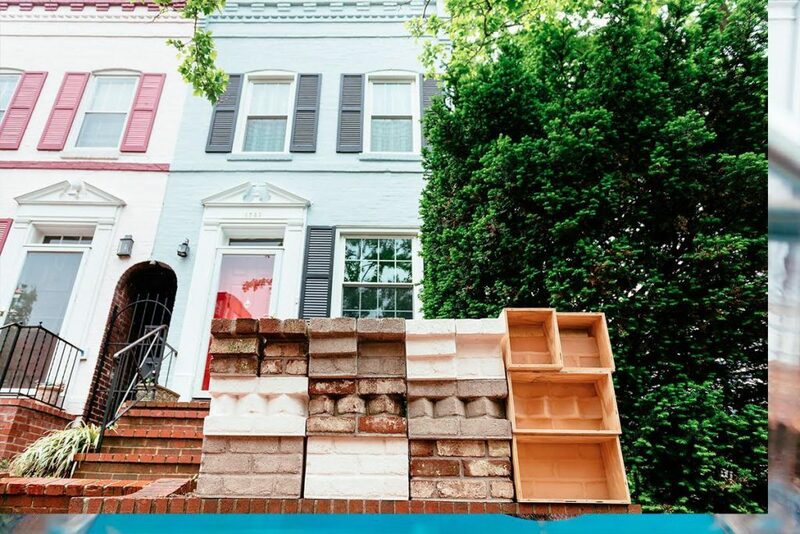 They’re too well done to be discarded construction debris, but they’re clearly not fit for the house they’re in front of. They’re inviting enough that they’d be nice to use, but crooked enough that you couldn’t possibly walk on them. Can you explain these juxtapositions? I love your description. 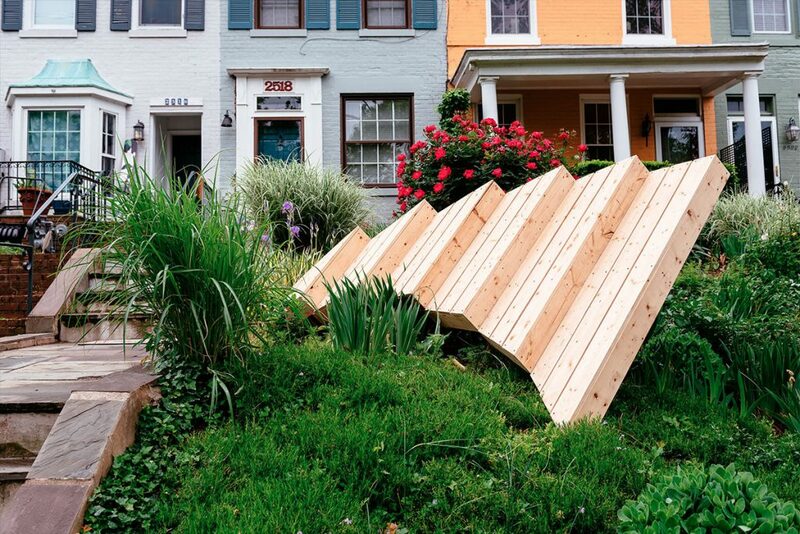 Rob’s work also plays on the idea of a monument, using lumber as another unlikely material. His monument pays tribute to the residential/pedestrian walkway, as an overlooked element of the neighborhood’s architecture. Rob was interested in calling to mind the unique features of this particular tiered property, which is unusual in the area. He’s definitely interested in that juxtaposition, where the stairs seem inviting but are precariously tilted, as more monumental than interactive. That allows visitors to spend a bit more time exploring the landscape of that property. This piece, more so than the others touches on activism and participation. 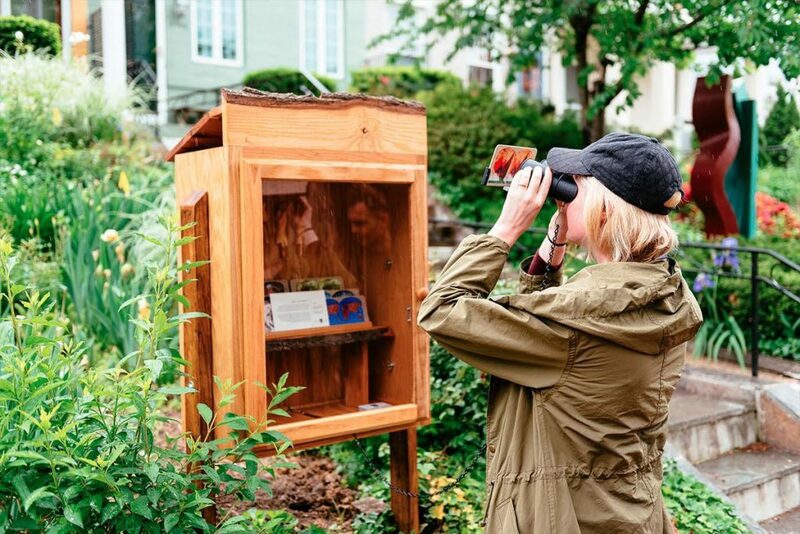 It also has the hands-on involvement of having to actively picking up to view and read the material while listening to the bird calls. This is a work that keeps unfolding the longer you spend time with it. The trailhead box is the first marker, as the only visible physical object on the site. It also holds the visual component, the stereoscopic cards that show composite images of Krista and Frank’s research on extinct birds in the Mid-Atlantic region. As you spend time with the cards, you begin to hear the calls of endangered birds that are organized in Morse code that are being played throughout the site. This is a sort of reverse bird walk, which relies on modern technology to hear these threatened species. The sound is also on an algorithm that decreases the bird calls over time, so the longer you stand with the work, the fewer bird calls you’ll hear—an effect mimicking growing extinction rates. 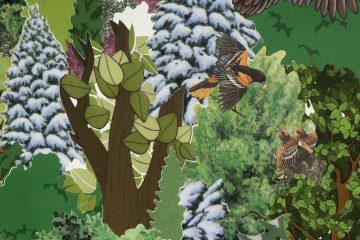 Lisa Dillin’s work seems to focus back on the environment it’s put in. 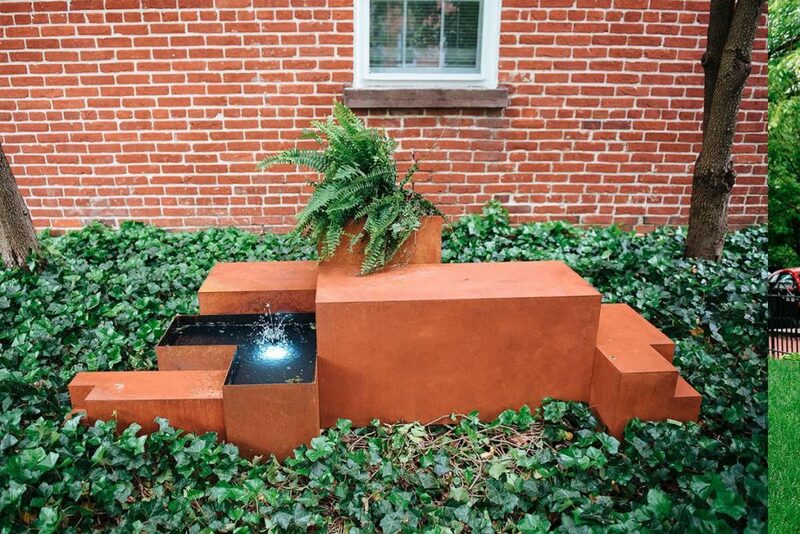 In this case, a boxy steal fountain sits in the greenery, and looks as if it could also function in a strip mall, or an anonymous convention center. But that also seems to be the point, it shifts focuses from this fabricated object sitting in a lawn, to the lawn and the house it’s in front of. Essentially the architecture of the house and the staged lawn is as out of place as the fabricated fountain. A man made structure with hints of a natural environment that is clearly manipulated to look like a little bit of “nature”. Just as a fountain in a strip mall is supposed to function as a tranquil bit of nature in an entirely manipulated environment. 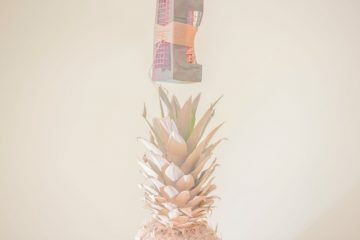 By routinely making work that focuses on the minutiae and details of the everyday, Nicole Herbert is the only artist I know who actually comes close to eliminating the artist’s ego. 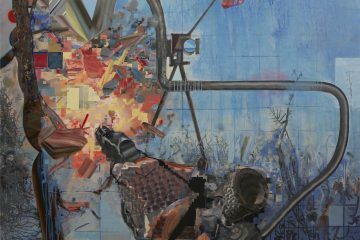 She removes tacit role of the artist giving much needed space for the viewer to solely consider the work without the baggage of the artist intent. Her work points to the often overlooked roofline of the houses, and brings those details down to street level. While the work is certainly sculptural, it might be overlooked as art and seen as functional. Can you explain how you see the public interpreting the work? And is the role of the artist diminished if it’s not seen as art? I don’t agree that the work is not seen as art. 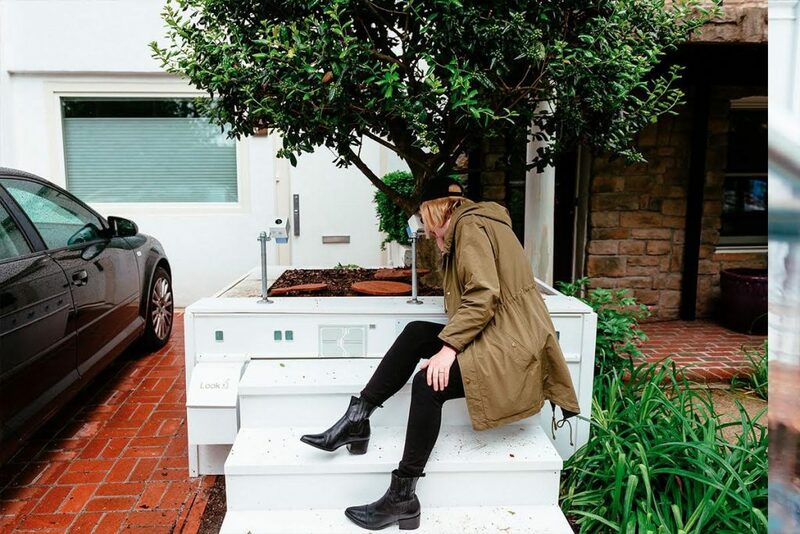 Nicole’s use of four materials arranged in a pattern clearly give the sense of construction that seems more purposeful than an architectural element. 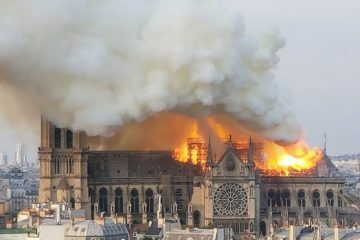 However I do think that the original patterning at the top of the building is just as important as the work itself, that they have a symbiotic relationship, where the lines in between are fuzzy. The artwork calls attention to this overlooked decorative work specific to Foggy Bottom, and the roofline lends the artwork its form and composition. By using brick, concrete, and plaster, Nicole is elevating overlooked materials and bringing them together in conversation. Then the wooden/polyurethane molds bring the visitor behind the scenes of her process. She’s a guide here, offering us a new way to interact with mundane details, which are often overlooked but carry their own, important histories. Neighbors have really grown to love this work as well, because I think it gives them newfound pride in the architectural legacy of their neighborhood. This might be my favorite work in the show, it’s sci-fi nerdy and wonderfully playful. Can you explain his yeast reference, and the participatory nature of his workshop? The project’s starting point is the United States Naval Observatory that was previously in Foggy Bottom and was the timekeeper for the entire country, sending out the time via telegraph at noon each day. The original observatory connected people around the world with the precision of time. Precision and connectivity are now inescapable, so Ben is hoping his Microobservatory will benefit visitors by focusing on the local on a smaller scale instead. 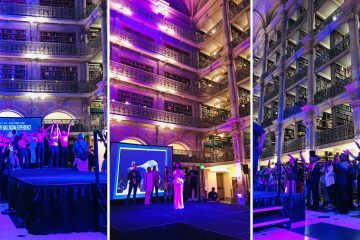 He is turning the attention of the “micronauts” to the wild yeast and bacteria in the air as the invisible ecosystem of Foggy Bottom, which could potentially be traced directly back to the yeast used by the Abner Drury and Heurich breweries in the area in the 19th century. 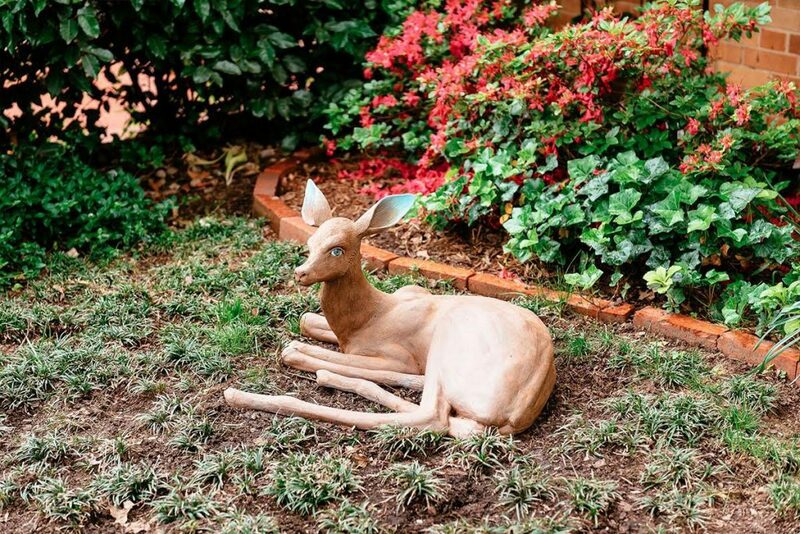 Pichaske’s deer-like sculpture sits in a tiny front lawn, as if it’s quietly observing the neighborhood. This piece could probably be passed by as just a ubiquitous lawn ornament if the viewer didn’t do more than glance at it. But once you look at it, it really becomes odd. Lindsay wanted this creature to feel natural to the landscape, as if it had chosen this site as its habitat. She spent a lot of time studying deer anatomy to give the appearance of a creature we’re all familiar with, and probably take for granted. But this animal has strange features, upon closer inspection. The legs tucked under its body are long and spindly, too tall for natural movement, and its body is textured to blend into the earth. It has bright blue, human-like eyes that stare out, in a way that would never happen with a timid deer, and matching blue-tipped ears, as if a magical creature. Lindsay’s creatures are in many ways human and animal hybrids, with the features and coherence of both. They live somewhere in the slippery space between, challenging classifications and calling attention to our relationship with the animal/natural world. This work also allows us to reflect on the overlooked lush landscape of 26 th street, and the property it has chosen as its home. 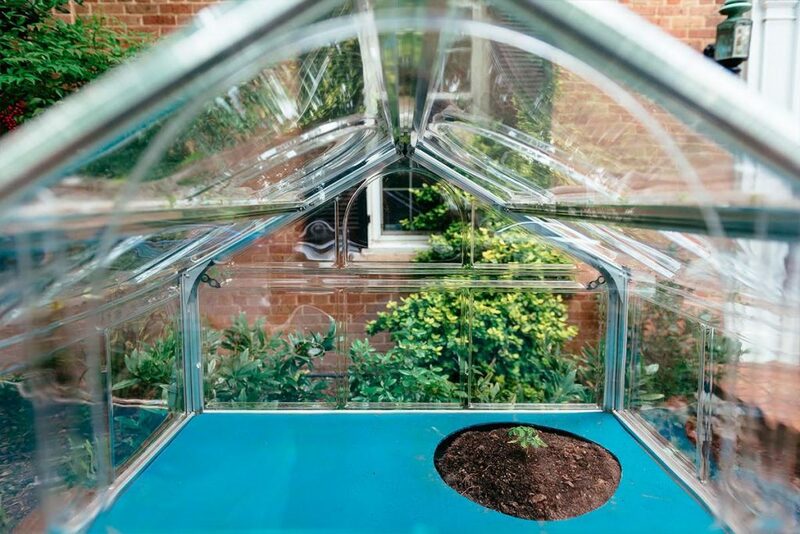 Patrick McDonough’s work places a tree that needs a warmer climate in a terrarium with the possibility of thriving. This work is time based, and experimental. That tree isn’t cut out for this climate, and it could die, which doesn’t change the success of the work, but does speak to the environment. Is it dystopic? Is it hopeful? So the tree is really thriving! I checked on it today. Patrick is interested in the potentially positive benefits of global warming. If the area warms, we can plant moringa trees, known for medicinal and even water purifying capabilities, in our yards. If that is a positive benefit, how does that impact our conversations around climate change? How does that change our relationship to our local environment? This is also part of his greater project on radical leisure, which questions how we separate leisure time from the rest of our lives and activities. What if leisure was radical? Where something like gardening could have political, and maybe dystopic, implications? I know I’m answering your question with questions, but I think that’s important for this work. It’s about starting a conversation. 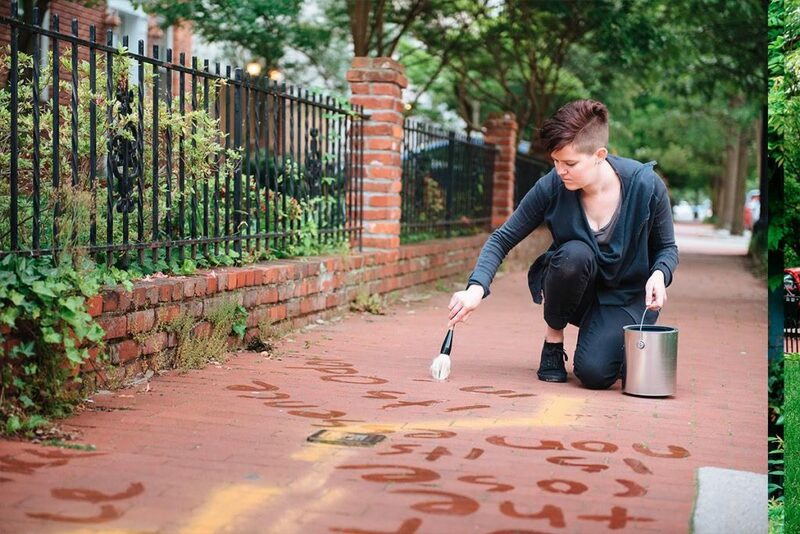 Eames Armstrong has a series of performances where she is painting text onto the brick sidewalk with just water. The poems evaporate as the performance progresses, and the temporality of the piece is dependant on the heat and humidity of the evening. Eames is the only performance artist in the show, what was the thinking behind including her work in a sculpture biennial? Has it been difficult for the viewers to make the leap to performance art? The neighborhood has really responded to having performance art in the show, and we’ve even had other performance artists contact us to find out about the next call for entries. I was really interested in having Eames involved because it allows the show to exist throughout the neighborhood as well as being tethered to specific sites. It also questions what we consider outdoor sculpture more than any of the work, and that’s a conversation I really wanted to be having with people about the show. 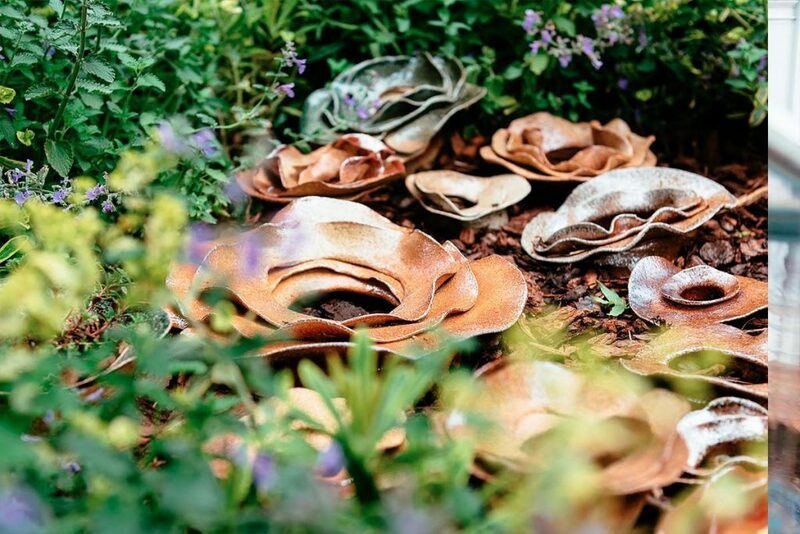 These ceramic pieces seem like a mushroom colony poking through the vegetation. Can you explain the material and how it will likely change in the environment? The ceramic forms were all made using soda firing. Julie actually has a great description on her site. They won’t change over time, they’re really hardy, but their relationship to the garden surrounding them has changed. 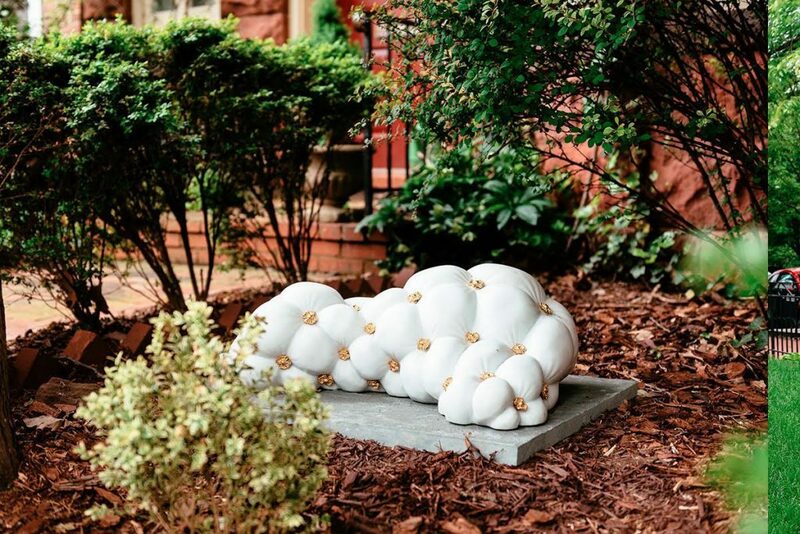 The plants were selected by the artists and the homeowners and they keep growing in and around the plants, interacting with them and even obscuring them. We’ve had to be creative in our gardening to best suit the organic nature of the works, and to create—as you say—a sort of colony for the ceramic forms. Tours and performances start at the yellow house on 842 New Hampshire Avenue NW. Next ArticleCall for Artists for Station North Mini Golf!